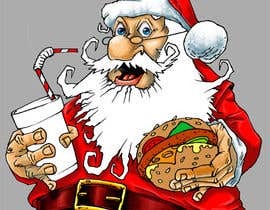 Design a jumbo poster with "Crazy Santa" character for a fast food winter marketing campaign. - IMPORTANT! Please check added files to see what kind of design/drawing are we looking for. 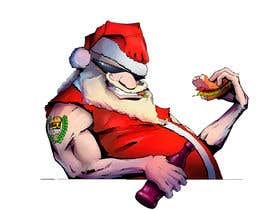 The character of "Crazy Santa" will be used for several things. 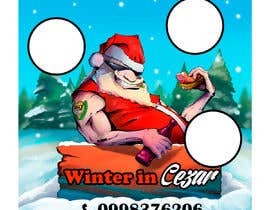 First as a jumbo poster on the wall of fast food object 2.5mX2.5m dimensions, but also on stickers, flayers, and shirts so we need your work to be done so it can be used for all dimensions. - It has to be "cool and crazy" aiming at a younger audience. Burger and a coke/beer in hand could be the way to go with your design. You need to make some kind of background for the jumbo poster (Snow maybe) and leave three circles blank so we can put pictures of our new food products in it. 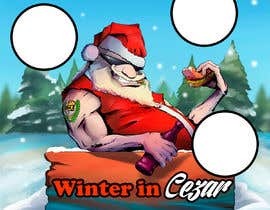 There are several more things to include in the poster: Cezar Logo (Check files), Phone number for delivery 0998376206 and the name of the campaign - "Winter in Cezar"
After we choose a winner, there will be more work for him in designing flyers, shirts, and other material. I am sorry for a delay with a final Winner decision... I am still waiting for my partners from Coca-Cola and will have their opinion during next week. Greetings! At the moment I'm sketching and rendering my poster concept. Hopefully you won't actually close the contest yet before the set deadline. Cheers!